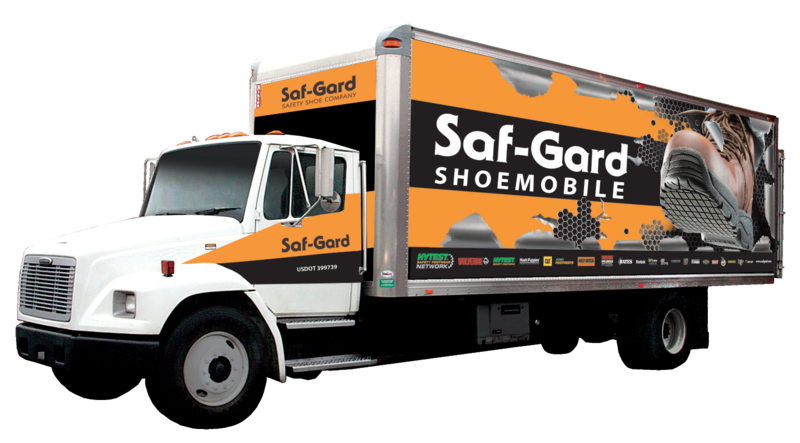 Saf-Gard also offers shoemobile service in select territories throughout the east coast. It is a convenient way to bring our slip resistant shoes right to your work site. These stores on wheels offer customers ample room to review our products and sit down while they try on new safety footwear. Each shoemobile carries a minimum of 1,600 pairs of safety shoes. Additionally, each truck is stocked with the customer’s specific needs in mind. There are several benefits of bringing the shoemobile service to your location. Experience the confidence in trying on a shoe before you buy it to ensure proper fit and style. Enjoy one-on-one personalized service from one of our specialists who can take foot measurements and recommend the right shoes for your specific work environment. Simply walk into the on-site shoemobile. Enter the showroom to browse, get properly fitted, find the perfect safety footwear and purchase shoes. Shoemobile services are offered to businesses that develop a direct employer-billing program and wish to buy in bulk. Any employer on the east coast that is within the Saf-Gard territory and is interested in outfitting a group of employees all at once should call to schedule a shoemobile visit today. Our Mobile Store Managers are trained to provide proper fittings. It is very important to be sure to have the right fit, not only for comfort but also to maintain healthy feet. Every mobile store manager uses a Brannock measuring device to get the exact toe length, arch length and foot width to outfit you with a proper fitting shoe. Many Saf-Gard shoes are so well built that they come with a 30-day unconditional comfort guarantee. Saf-Gard has a fit warranty for anyone who is measured by us and takes the recommended size. This warranty is good for 30 days from a customer’s initial safety shoe purchase. If a fit problem occurs in this period, then Saf-Gard will replace the shoes with the correct size in the same style. Saf-Gard believes that it is our job as professionals to help you get the right shoe for the job. Additionally, Saf-Gard offers the very best selection of sizes and widths in the industry.